If you manage a large property, it is vital that you make it easy for guests to find their way around. This is especially true if you operate a healthcare facility. Patients at these establishments are already anxious and stressed out due to their condition. Difficulties finding the right place to go can only compound the anxiety. 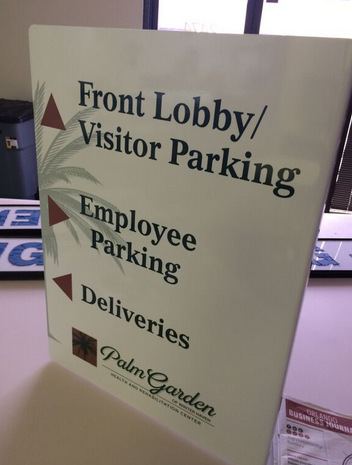 Palm Garden realized this, so they contacted the friendly professionals at Citrus Sign Studio for wayfinding signs for healthcare facilities in Winter Haven, FL. What Is Palm Garden of Winter Haven? Located on Cypress Gardens Boulevard in Winter Haven, Palm Garden Health and Rehabilitation Center is committed to leading in the areas of rehabilitation and skilled nursing. What sets them apart is their dedicated team with years of experience, passion, and unique approach. They serve their residents and patients with cutting edge therapy, compassionate healthcare, and enhanced clinical services. Their goal is to accelerate recovery for both their long-term and short-term residents. A look at their old wayfinding sign. 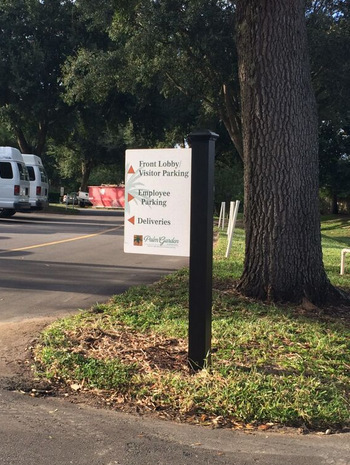 We were more than happy to help when an organization that does so much for local residents came to us for wayfinding signs for healthcare facilities in Winter Haven, FL. 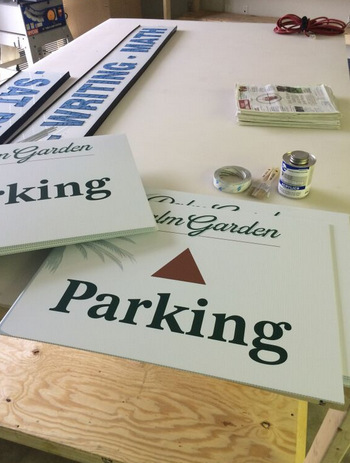 Palm Garden already had wayfinding markers, but they were looking worse for wear and did not feature their branding. Fortunately, they contacted the right sign company for the job. What a difference the new branded signs make! This job was part of a larger renovation project that Palm Garden of Winter Haven was undergoing. We listened carefully to their goals for the project before making our recommendations. To help with their rebranding efforts, they included their new logo in their wayfinding sign. We fabricated the new marker out of aluminum. Once the sign was ready, we removed the old property signage and installed the new one. In addition, to fit the new feel and appearance, we also updated their window signage. Now, Palm Garden is building their brand awareness while helping visitors and patients find their way around the property. The client was completely satisfied. Wayfinding signs are not only helpful for your healthcare facility, they are also often required by law. Local ordinances as well as the Americans with Disabilities Act set out guidelines about how to make your property more accessible to people of all abilities. When you fail to follow these regulations, you leave yourself open to lawsuits, complaints, and upset clients. Fortunately, we can help you out in this department. One of the most rewarding and challenging issues designers of medical facilities face is creating a comprehensive wayfinding system. We have plenty of experience outfitting healthcare buildings with wayfinding systems that increase efficiency and save time and money. By mapping out wayfinding plans, we can make certain guests to your facility arrive at appointments on time. 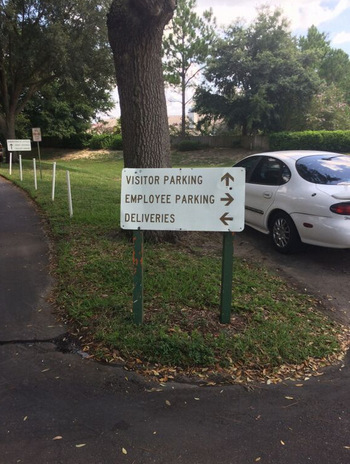 If you are not sure if you are complying with the ADA, have trouble with patients getting lost, or you just want to make your facility a more enjoyable place to visit, contact Citrus Sign Studio today to learn more about healthcare wayfinding signs.